Enabling Filters will allow the user to select from 6 different filtered versions of their photo: Color, B&W, Sepia, and 3 different Instagram style Vintage filters. Note: Overlays will be applied on top of the filters, so things like logos will appear as they are intended. 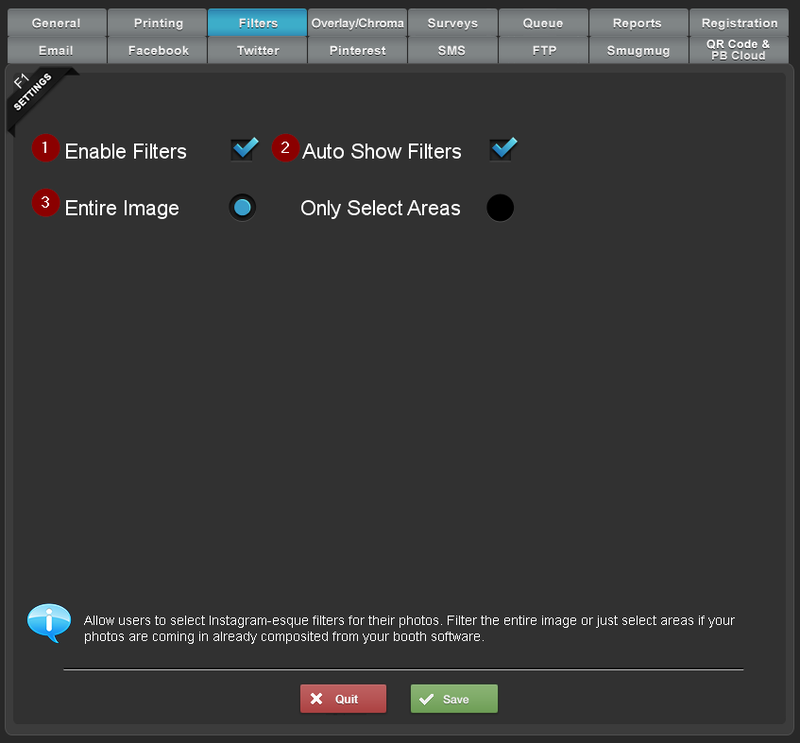 This will show the filtered image as soon as the user selects their photo. Disabling this will show the color photo first, and the user will have to select the Filters button to display the filtered images. Filtering the entire image will apply the filter to the total image. This may not be the effect you want if you are filtering something like a photo strip that has already been composited with artwork and logos, etc... In this scenario, you will probably want to define specific areas to apply the filters to, leaving the artwork untouched. To set this up, simply define the number of photos in your layout and their location and sizes. The height and width are in pixels and the location is the top left corner of each photo. You will more than likely need to get this information from the rulers in Photoshop or another graphics editing program.